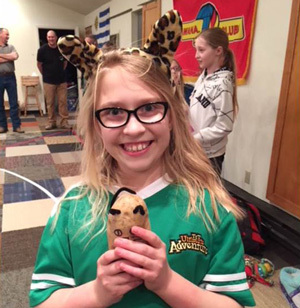 AWANA Clubs are held Wednesday evenings, from 6:30-8:00PM. If you’re looking for the premier program to change your kids' lives, you’ve come to the right place! AWANA is the leading ministry helping local churches reach children and youth for Christ. 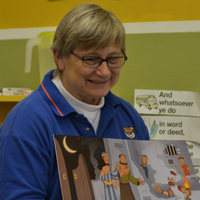 AWANA blends Bible teaching, Scripture memorization and tons of fun. Our church’s AWANA ministry will impact kids, families and entire communities! We use a complete and systematic approach for training kids from preschool to high school to know, love and serve Christ. Our exclusive circle games generate maximum fun at AWANA meetings. Training materials fully prepare our church’s volunteer leadership. Children and youth are also trained to serve. AWANA missionaries and their ministry teams provide hands-on training opportunities to the local church. We offer special events as outreach tools and service opportunities for young people and their families and friends. Parents are trained to be their children’s primary spiritual caregivers through AWANA Children’s Ministry Conferences and local training sessions. Learn more about AWANA by visiting the AWANA International website. You can now register your child for Awana at Falcon Baptist Church online here. The AWANA program is based on reaching children with the gospel of Christ and training them to serve Him. A consistent gospel message is wrapped around a fun-filled game time, individual attention during handbook time, and weekly theme nights. Parents are always welcome and several annual events offer unique opportunities for everyone to join in the fun. Call the church office for more information (495-3859). The Awana Commander is Craig Meredith. Cubbies is for preschool-age children and it includes games, puppets, crafts, awards, and other exciting activities. Your child will find a lively weekly experience where fun and learning go hand in hand. Sparks is for children kindergarten through second grade. The events combine learning with fun to teach the clubbers more about Jesus! Truth & Training is for third through sixth grade boys and girls. They will learn the truth of God’s Word and learn how to follow Christ in their daily lives. Trek is for middle school boys and girls. The students to wrestle with the three most important questions they’re asking in middle school: Who am I? Why am I here? Who's with me? Journey is for High Schoolers. Journey establishes high school students as lifelong disciples through a deep study of God's Word, mobilizing them to live with godly perspective and evident faith.